Though I usually have M make all of her valentines, I decided to do things a bit differently this year. She has many of the same kids in her class as last year and I didn’t want to give them the same foam heart with foam letters and heart stickers. Plus, I’m all about gifting things that are also useful. Often valentines are store bought cards and/or candy. Which is fine. But four year olds only need so much candy. Instead, I decided to use some of my dish cloth cotton to knit heart “scrubbies”. These nice little hearts can be used to scrub dishes or as wash cloths. Plus, with their super convenient crocheted loops, they can be hung in the dishwasher or be thrown in the wash. I did try making a crocheted heart to see if it would take less time and look nicer… but it took at least twice as long… just to do one side of it. I asked M on Thursday morning which of the two she preferred. Luckily, it was the knitted heart. So M’s teacher was gifted the larger, “fancy” heart and I made ten (I promise, even if only eight made it into the picture!) 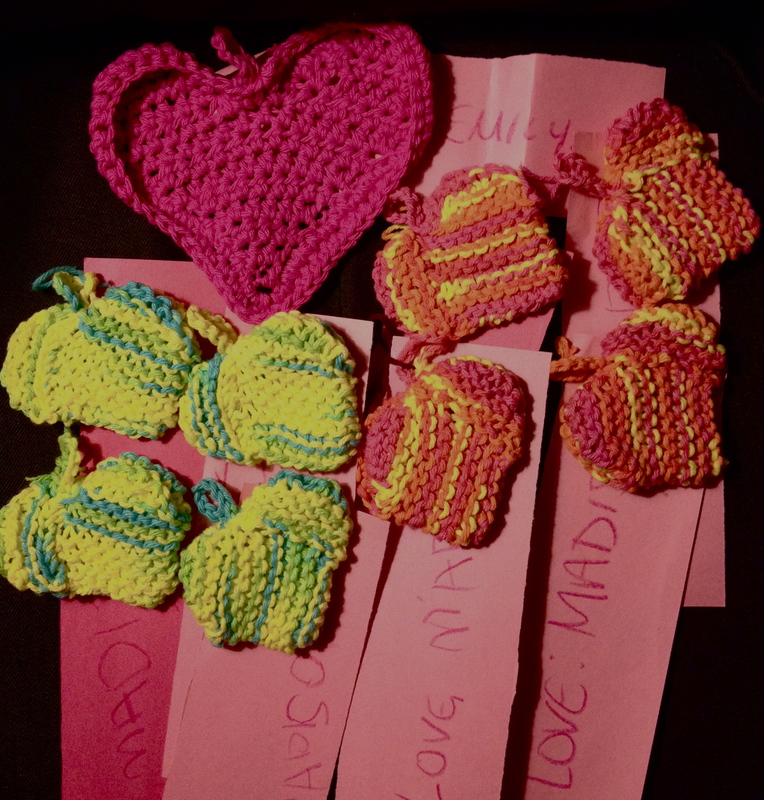 of the little knitted hearts. In order to give each valentine M’s special touch, she was in charge of writing out the tags with each child’s name and her own. Which, for a four year old, is a lot of hard work! M was so pleased with how they were turning out, she started to list other people I should make the hearts for. Since I was working on most of them during our snow day the day before Valentine’s Day, I told her the others might have to wait until next year! Once Valentine’s Day was over, I had the three-day weekend ahead of me to craft on whatever I wanted. I always find that after (self-imposed) “obligation” knitting is complete, I want to do nothing but spin. Since I was out of the house most of the weekend, I did work a lot on my mother’s sweater. 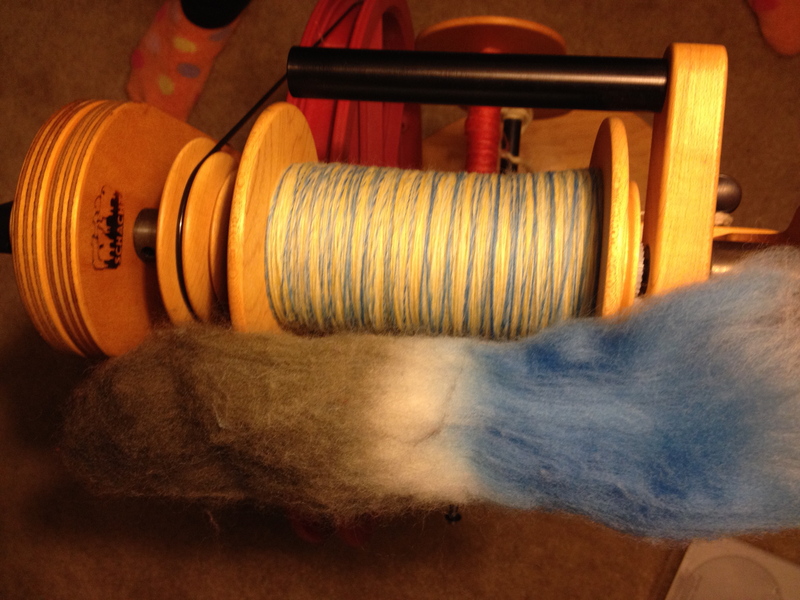 But whenever I was home, I worked on spinning up some Highland Handmades’ Polwarth (aka Pitch Pine Top) in the SSKers For the Win colorway. On Presidents’ Day, I took advantage of my day off to not only clean my place, but to sew the rest of the fold-over hems on my father’s sweater as well as sew on the six buttons. One would maybe think this should have been done back in September when the knitting was finished. But after finishing the hems at the bottom of the sweater, the collar and both the sleeves were incredibly intimidating. Not to mention time consuming. I kept fearing I would get nearly to the end of the collar, only to find that I had sewn it askew. Luckily, I had an easy way to line up the sleeves as the hem portion was continued directly from the rest of the sleeve and I could line up the stitches exactly. However, the collar portion had been picked up and knitted from the cast on of the sweater, so there was not the same number of stitches and with the raglan increases, the stitches in the sweater were at an angle while the “hem” was straight. It took some doing and a lot of straight pins (which are incredibly useless when sewing knitting), but the sweater is now finished. 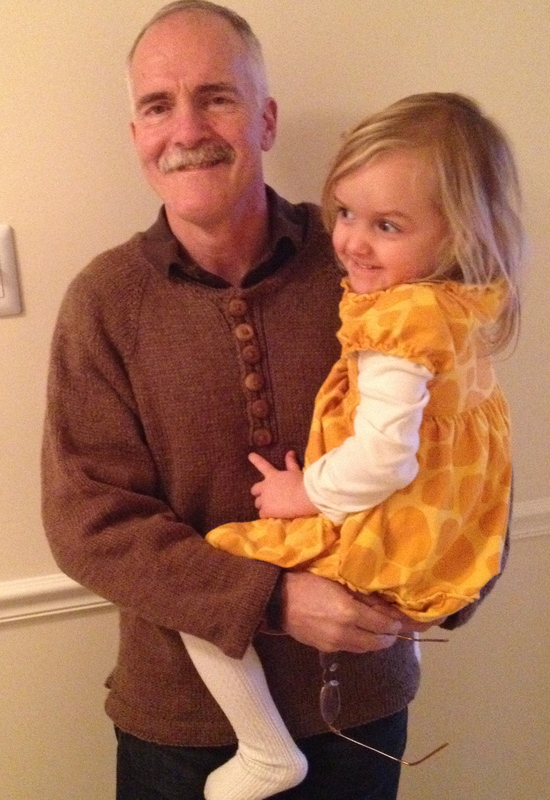 My father, who was over spending some play time with M, was able to wear it home. I might not be completing my intended goals during this Olympic season, but at least I seem to be staying on track with my overall year goals of completing these sweaters and using up stash!